Drooling is something Calvin has pretty much always done. His physical therapists have thought that it is the result of Calvin’s low muscle tone. It made sense to me, having seen children and adults with cerebral palsy troubled by incessantly glistening lips—shining saliva strands stretched from chin to collar. When Calvin was a baby he wore bibs all day long to protect his clothing from getting soaked. Sometimes, though, that wasn't a sufficient barrier to the constant wetness which causes a mild prickly rash to form on his chest. In preschool, we began tying cotton bandannas around his neck. Folded diagonally, I sewed thick batting into the middle of each bandanna like a cotton sandwich, then stitched in his name. 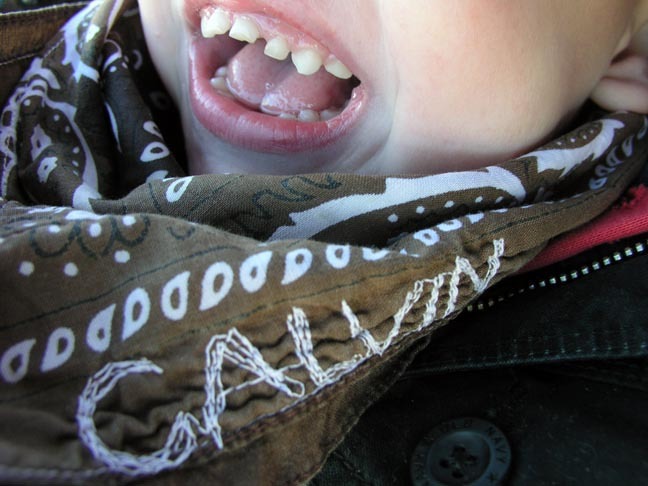 The colorful western kerchief became Calvin’s signature. He goes through about five to ten each day, our chairs, tables and freezer draped with limp, bright cloth triangles like the drooping clocks in a Dali painting. About a year and a half ago we weaned Calvin off of one of his seizure medicines, Clonazepam, a relative of Valium. He stopped drooling. You’d think I’d won the lottery. What an incredibly liberating feeling just to put his shirt over his head and be done with it. No bandanna. And to see my sweet boy’s cute little neck peeking above his collar ... well, I can’t really describe the feeling except to say that it was pure motherly bliss. It’s amazing what one tiny, seemingly insignificant event or discovery can do to lift my spirits amongst so much anguish, drudgery, angst, fatigue and despair. But when these small gifts are bestowed upon me, I don’t take them for granted. In life, nothing is guaranteed. We replaced Calvin’s Clonazepam with its cousin Clobazam, and the drooling returned. I tell myself there are worse things. And there are.